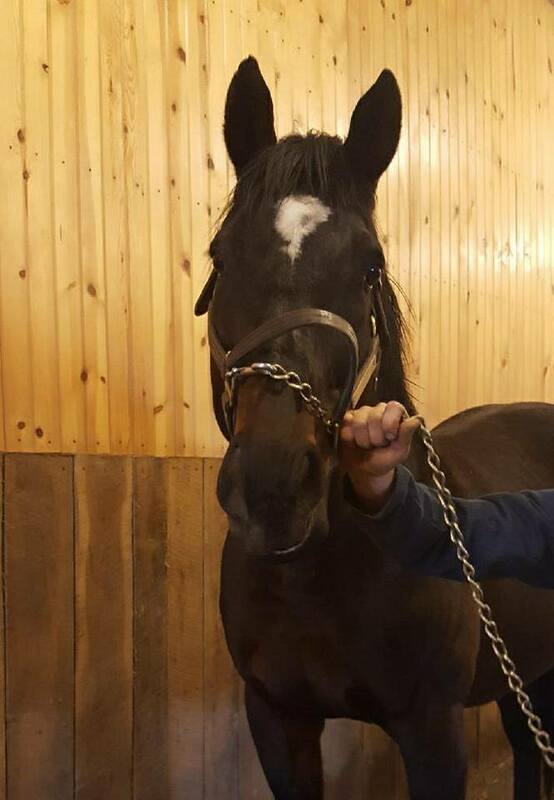 Thoroughblog friend Janine H. recently sent us photos of 2004 Champion Older Male MOBIL at his home at Mapleton Farm in Ohio. Now 18, the son of Langfuhr, bred and raced by Gus Schickedanz was sire of the year in Ohio in 2016 and among the leading stallions in that State again in 2017. An amazingly versatile runner. Mobil won races such as the 10 furlong, Grade 3 Dominion Day, the 7 furlong Vigil Stakes (Grade 3) and the 9 furlong Halton Stakes on grass. 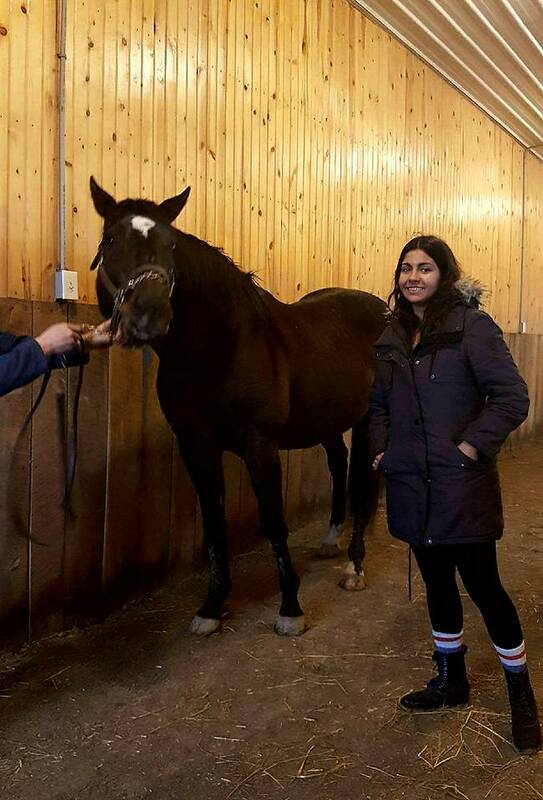 He won 12 of 29 races and over $1.8 million in his career and was trained by Mike Keogh..
Janine wrote on her Facebook page.. Had one last farm stop on our way back to Canada to see Canadian champion and the horse that got me into racing in 2003, Mobil. I spent a good many years obsessed with Langfuhr offspring and of course Mobil being so tough to work with became my favourite. He is 18 years old now and was relocated to Ohio. He’s still the same, spent the whole time biting everything he could reach. We even got to meet a bunch of his yearlings! 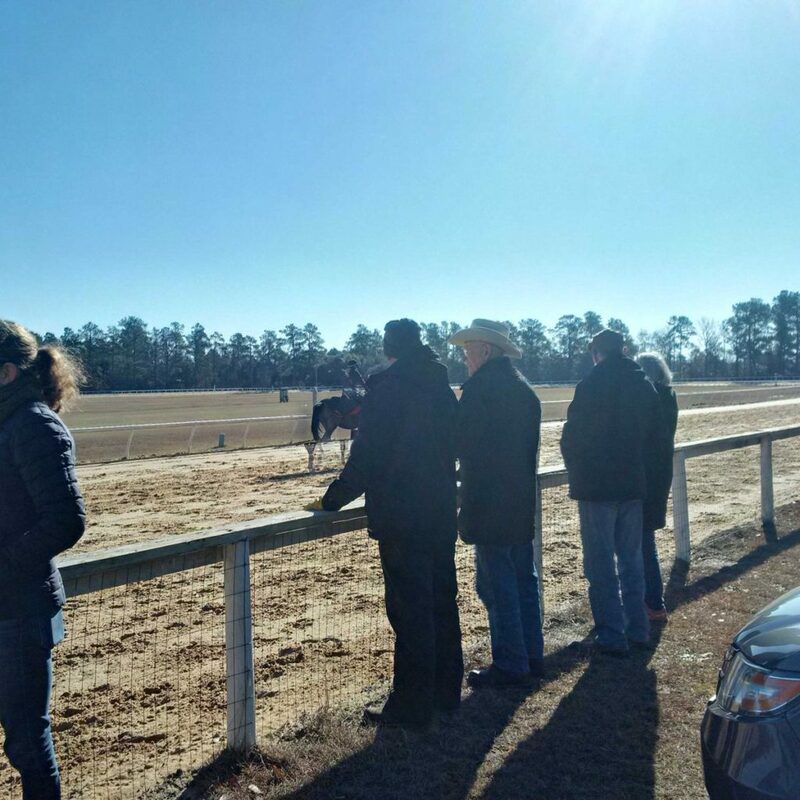 Janine recently went on a whirlwind tour of many breeding farms in Kentucky and has posted gorgeous photos of horses such as Tapit, American Pharoah, Curling, Arrogate and more on her FB page. 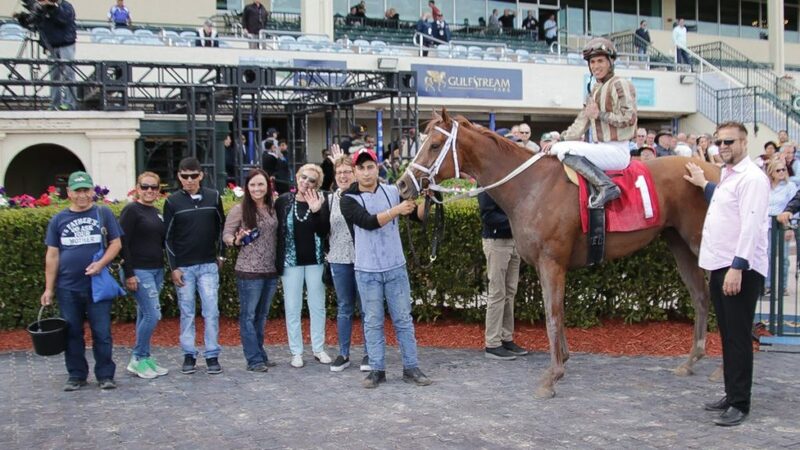 Ontario owner Carl Dowson and trainer Bill Tharrenos celebrated a big won at Gulfstream Park on Friday when FORTY’S SWEETHEART won an allowance/optional claiming race as the longest shot of the board. 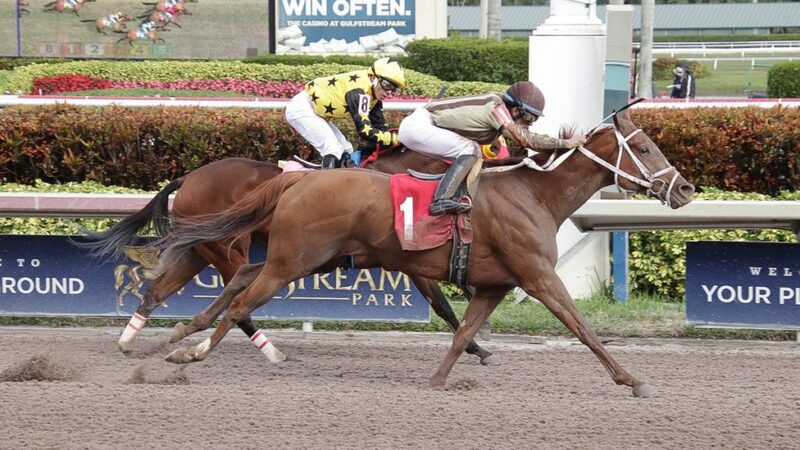 The Florida-bred filly by Forty Grams won the 6 furlong race by 1/2 a length at 14 to 1 under apprentice jockey Aby Medina and collected $26,400 for the win. The filly recently came to Florida for Dowso and she had been racing at Woodbine for trainer Richard Morden. The filly’s time of 1:12.07 in her first dirt race was good for a 64 Beyer Figure. Clarkson purchased CUMULONIMBLE for $60,000 in foal to Majestic Warrior from the Keeneland November Breeding Stock sale in 2013. He sold that foal for $5,500 at the 2015 Keeneland September sale and then sold Ms Bad Behavior for $75,000 at Keeneland September in 2016. Clarkson also sold a yearling by Twirling Candy, a colt, for $65,000 in 2017 at Keeneland September. TAKE YOUR PLACE won a maiden $25,000 claiming race on Friday at Gulfstream for owner Murray Stroud and trainer Dan vella. Stroud, a Florida resident, has horses in training at Woodbine each year and he recently won a race at Penn National with Woodbine trainer Steven Chircop. Take Your Place, a homebred by Into Mischief, won by 4 1/2 lengths at 5 to 1 and was claimed. RAINBOW 6 THOUGHTS FOR SATURDAY- Kevin Attard’s JUBILEE a key? raxe 10 SUNSHINE MILLIONS FILLY/MARE TURF – Canadian owned and trained STARSHIP JUBILEE will be the big fave and is the one to beat.